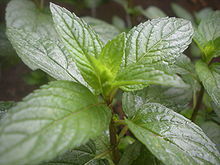 Effects On The Mind - Peppermint can relieve headache and help to stimulate the brain and aid clear thinking. Effects On The Body - Peppermint has been used for its digestive properties for years, because it has a beneficial action on the stomach, liver, and intestines. Peppermint is also valuable as an antiinflammatory, antiseptic, and helps the respiratory and circulatory systems. When combined with Lavender and Marjoram, Peppermint is especially valuable in treating fevers, because it induces sweating. Peppermint can help reduce fever naturally and clear nasal passages and sinuses. Blends Well With - Rosemary, Lavender, Marjoram, Lemon, Eucalyptus, and other mints. Useful for the medicine cabinet! Great for headaches, muscle aches, digestion. Love the cooling effect on the skin.